(Nyctea scandiaca) Snowy owls have keen eyesight and great hearing, which can help them find prey that is invisible under thick vegetation or snow cover. What does the Snowy Owl eat? The snowy owl is a carnivore. Snowy owls preferred meal is lemmings. An adult may eat more than 1,600 lemmings a year, or three to five every day. The birds supplement their diet with rabbits, rodents, birds, and fish. In the wild, they live approximately 9-10 years, and 25 to 30 years in captivity. How many snowy owls can be born at a time? Females lay a clutch of 3 to 11 eggs. These magnificent owls sometimes remain year-round in their northern breeding grounds, but they are frequent migrants to Canada, the northern United States, Europe, and Asia. Lemming availability may determine the extent of southern migration, when owls take up summer residence on open fields, marshes, and beaches. The snowy owls beautiful white plumage helps to hide it in its Arctic habitat. The males are much whiter than the females. Chicks are dark and spotted, while the females are white with spots on their wings and chest. Snowy owls have keen eyesight and great hearing, which can help them find prey that is invisible under thick vegetation or snow cover. 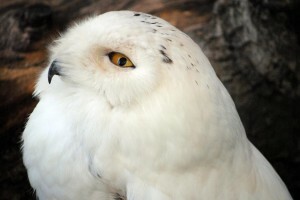 Unlike most owls, which are nocturnal, snowy owls are diurnal—they hunt and are active both day and night. Their wingspan is over 4 feet wide. Cyrus – came to us in 2007 from a rehabilitator and he was imprinted, as well as having an abnormal wing. The wing had to be amputated eventually because it was so deformed. Cyrus likes to stand inside his igloo and peek out at people. He has feet that have lots of feathers on them; it helps to keep his feet warm in the winter. It also makes him look like he is wearing fuzzy slippers!